Health care professionals may contact our Referral Service at (888) 327-5533. Please complete the referral form to make a referral. University Eye Center’s specialty services may supplement the excellent care provided by the optometrists, physicians, and other health care professionals who refer their patients to us. We are committed to building trust and positive relationships with our referring professionals and their patients. To ensure a smooth working relationship, we promise to answer your calls promptly, schedule your patients as soon as possible, keep you informed and involved in your patients’ care, and serve as a professional resource that you can call upon as needed. Important: Please send a copy of the most recent eye exam along with this form. I would like my patient to continue care at SUNY for the referred issue. Patient is to return to me for comprehensive care. I would like to transfer care of this patient to SUNY. Your patient may be seen for testing only or testing with interpretation by one of our clinicians who specializes in the diagnostic area. A Scan Ultrasonography uses the speed of sound through the different media of the eye to allow the clinician to assess axial length. B Scan Ultrasonography uses the same principles to allow the clinician to assess the various structures of the globe and posterior segment. Commonly, retinal detachments and lesions are assessed with this technique. This device maps a patient’s anterior and posterior corneal surface with respect to thickness, surface power and contour. Common indications include determining a patient’s eligibility for refractive surgery and aiding in the diagnosis and management of corneal diseases, such as keratoconus. Diseases and abnormalities of the cornea, angle, lens and retina are documented by means of photography throughout our clinics. Optos panoramic viewing allows for 200° wide field color imaging through a pupil as small as 2mm diameter. We perform fundus autofluorescence imaging with Optos. This procedure involves injecting a small bolus of fluorescein into a patient’s arm and photodocumenting the flow of the vegetable dye derivative through the choroidal and retinal vasculature over time. An exciter filter and a barrier filter allow the fluorescein to fluoresce and block out all other wavelengths. Macular edema and vascular abnormalities, such as neovascularization, are commonly assessed by fluorescein angiography. The GDx (Glaucoma Diagnosis) VCC (Variable Corneal Compensation) uses scanning laser polarimetry and the birefringent properties of the retinal nerve fiber layer to assess thickness and check for changes over time. The Heidelberg Retinal Tomographer 3 uses confocal laser scanning technology to measure retinal contour, especially of the retinal nerve fiber layer as it converges at the optic nerve head. Changes in the optic nerve head and nerve fiber layer contour over time may be monitored. Meibography is a non-invasive diagnostic procedure which allows infrared imaging of the Meibomian glands along the eyelids. It is useful in diagnosing Meibomian gland dysfunction. Using the principle of laser interferometry, this device records a patient’s axial length, anterior chamber depth and corneal surface curvature. These measurements are then incorporated to calculate the correct intraocular lens power to be inserted after cataract extraction. Optical Coherence Tomography is a non-invasive diagnostic instrument used for imaging the retina. Doctors are able to see a cross section or 3D image and detect a variety of eye conditions and eye diseases such as macular degeneration, glaucoma and retinopathy. A pachymeter uses ultrasound to determine a patient’s corneal thickness and is typically part of a glaucoma evaluation. Spectral Domain OCT takes many more readings per second than earlier technologies (Stratus) and provides the clinician with a 3-dimensional topographical view of the retinal tissue of concern at a much higher resolution. Commonly, macular edema and retinal nerve fiber layer thinning are quantified using this device. The Ultrasound Biomicroscope (UBM) uses ultrasound to acoustically assess the characteristics and relative positions of the various structures of the anterior segment. The angle may be assessed as open, closed or occludable. Automated Kinetic Perimetry applies the same principles as manual kinetic perimetry however, instead of a trained perimetrist manually moving, choosing and displaying the targets, these functions are programmed into a computer. Automated Perimetry involves systematically quantifying a patient’s visual field by showing to an illuminated target against a defined background and recording the patient’s response. The target is shown at different intensities and positions in order to plot the extent of the patient’s visual field and define the patient’s threshold at each test position. Ocular and neurological conditions which can affect the visual field are commonly assessed in this way. Electrooculography is an electrodiagnostic test to assess the function of the retinal pigment epithelium. The clinical application of this test is to help rule out one of the hereditary retinal diseases that often affects macular function, called Best Vitelliform Macular Dystrophy. The test takes about 45 minutes and tests saccadic eye movements under scotopic and photopic conditions. It is usually performed in the Hereditary Eye Disease Clinic. Electroretinography assesses the function of the neural cells of the retina, especially the photoreceptors, by quantifying their electric responses to visual stimuli. 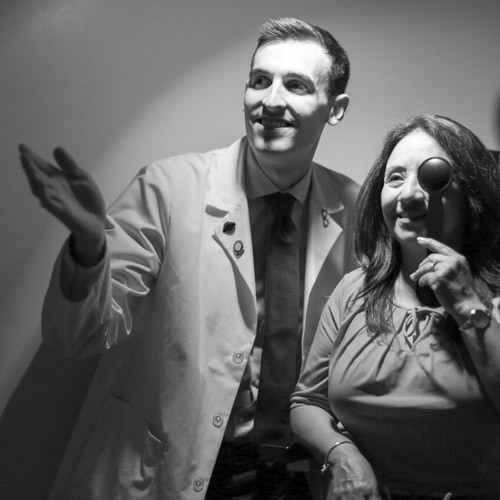 The procedure is done under photopic and scotopic conditions and is commonly used to aid in the diagnosis of and monitor for progression in many retinal degenerations and dystrophies, including retinitis pigmentosa and cone dystrophies. This technique assesses a patient’s visual field and involves the use of a target best described as a sine wave grating of a low spatial frequency which flickers at a high temporal frequency. This perimetric technique tests the magnocellular pathway because the target has a defined temporal frequency. Manual Kinetic Perimetry involves a trained perimetrist who moves an illuminated target against a defined background. The extent of the visual field is mapped to targets of different sizes and brightness. The results of this method are plotted in the form of isopters, which are lines of equal light sensitivity that, when plotted for each light brightness and size, resemble a topographic map with the peak at the most sensitive points. Ocular and neurological conditions which may affect the visual field are assessed in this way. Visually Evoked Potentials are cortical responses to visual stimuli, usually flickering lights, which are measured by electroencephalography focused on the occipital cortex. Conditions with the capacity to affect these potentials, such as stroke and demyelinating disease, may be assessed in this way. Cortical function in non-communicating patients may also be assessed with this technique.